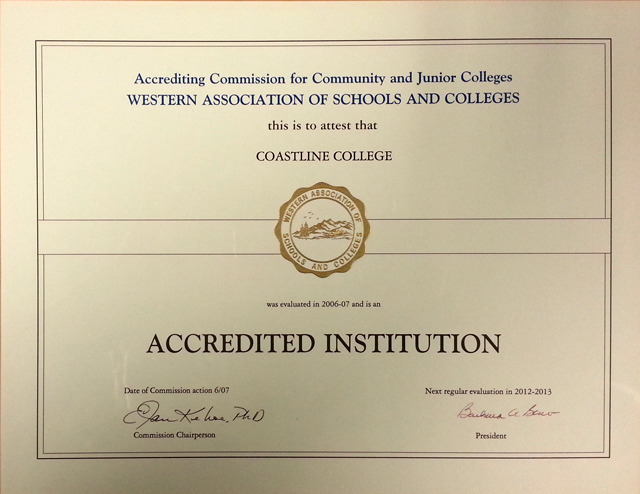 Coastline College is accredited by the Accrediting Commission for Community and Junior Colleges (ACCJC) of the Western Association of Schools and Colleges (10 Commercial Blvd., Suite 204, Novato, CA 94949, (415) 506-0234), an institutional accrediting body recognized by the Council for Higher Education Accreditation (CHEA) and the U.S. Department of Education. Additional information about accreditation, including the filing of complaints against member institutions, can be found on the ACCJC website. Coastline's Paralegal Program has been approved by the American Bar Association since 1985. The American Bar Association approval process can be found in the ABA guidelines most recently published September 2018. Each ABA approved program must go through a re-approval every seven years. An interim report is due to the ABA every three years through that seven-year cycle. Coastline’s most recent re-approval occurred in 2014 and interim report was approved as submitted in 2017. The next cycle for Coastline’s ABA approval will occur in 2021. A directory of ABA approved programs can be found on the ABA’s website. If you have any questions regarding Coastline’s ABA approval, please contact program coordinator Stephen Barnes (sbarnes@coastline.edu) or the ABA directly.